If there is something strange in your neighborhood, who are gonna call? The answer: Ghostbusters! One of the most talked about reboots is now out in theatres! The all-female lead Ghostbusters team (Melissa McCarthy, Kristin Wiig, Leslie Jones and Kate McKinnon) is taking the comedy-horror world by storm. Despite all the critics’ backlash and haters’ efforts to bring this film down, Ghostbusters delivers a great shot of comedy that we all desperately need in our veins. 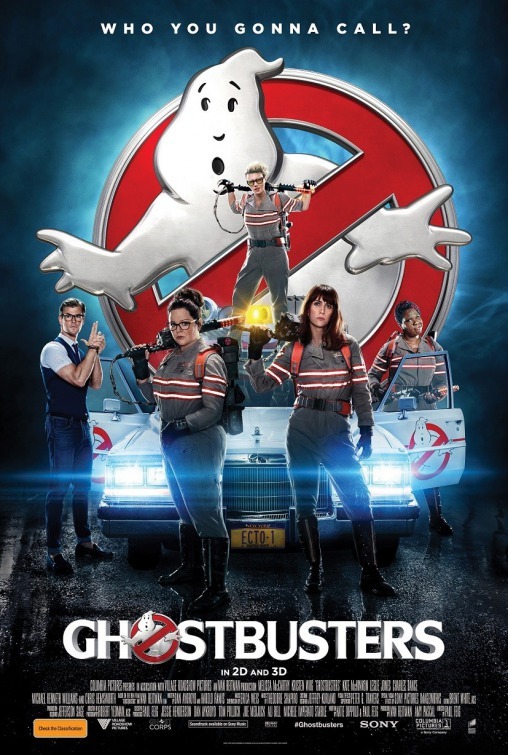 The Ghostbusters reboot focuses on the relationship between two long-lost friends Dr. Erin Gilbert (Kristen Wiig), a Columbia University professor, and Dr. Abby Yates (Melissa McCarthy) and how their obsession for paranormal and supernatural happenings in New York City reunites them. Originally, Erin reconnected with Abby, because she found out their published book on ghosts has been republished as a source of revenue for Abby. With her academic credibility at stake, Erin asks Abby and her new partner, the eccentric Dr. Jillian Holtzmann (Kate McKinnon), to pull the book off Amazon, in exchange for a lead. The trio investigates the museum and is confronted by an angry ghost. After being slimed on by the malevolent ghost and being kicked out of their respective academic institutions, the trio forms a business and begins to investigate the rapidly increasing paranormal cases in the Big Apple. Eventually, the trio crosses paths with NYC Transit Authority Employee Patty Tolan (Leslie Jones), who comes to the ladies after she encounters a ghost on the New York City subway. After confronting another angry ghost, Patty joins the team, and the quartet is assisted by their clumsy male receptionist, Kevin Beckman (Chris Hemsworth). Unbeknownst to them, Rowan North (Neil Casey), a paranormal fan and psychotic hotel custodian, is behind the sudden appearances of ghosts and has a built a machine that will unleash millions of angry spirits onto the Big Apple. Ghostbusters’ screenwriters Katie Dippold and Paul Feig (who also directed the film) delivered a fine screenplay that perfectly balances horror elements with slapstick comedy. The duo’s screenplay also allowed each actress to flex their comedic muscles by sprinkling zingers in with paranormal vocabulary terms. Also, it also allows them to pay homage to the 1984 film that jump-started the franchise (keep an eye on for cameos from Slimer and the Stay Puft Marshmallow Man). As for the acting, both McKinnon and Jones might be tied for the film’s Most Valuable Players’ award. Between Jones’ take no prisoners attitude and McKinnon’s hysterical facial expressions and actions, it is safe to say that the audience will have a couple of big belly laughs. Chris Hemsworth also showed that he does have a funny bone as the Ghostbusters incompetent receptionist. Finally, fans of the original Ghostbusters film will be excited to see several familiar faces in the movie. Several members of the original Ghostbusters team (Bill Murray, Dan Aykroyd, and Ernie Hudson) are among the famous faces that made cameos for the film. Also, keep an eye out for Ozzy Osbourne, Al Roker, Steve Higgins, and original cast members Annie Potts and Sigourney Weaver, who all made various appearances throughout the film.